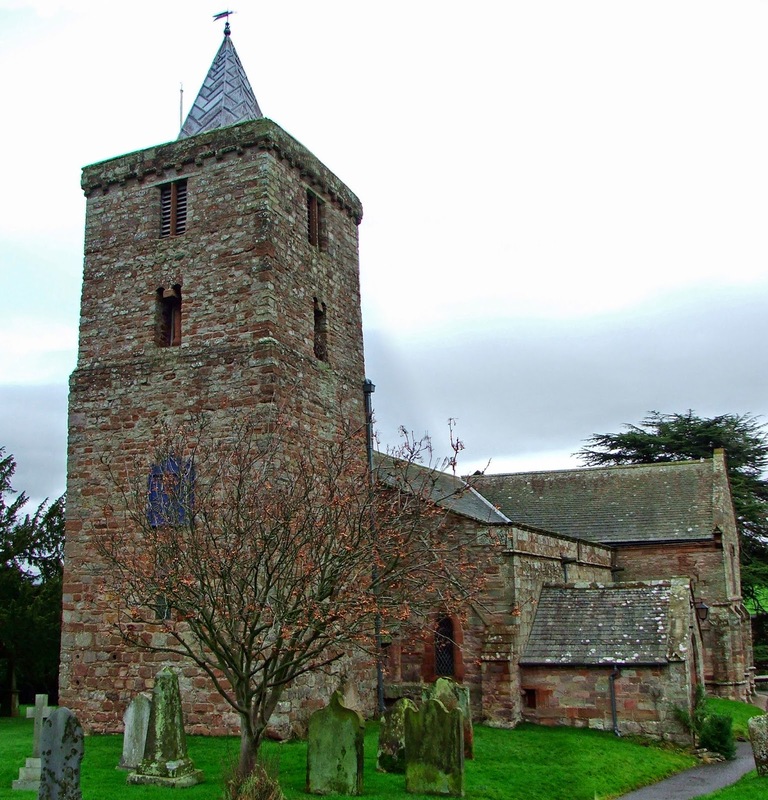 This is Cumbria's only surviving Saxon church tower, and as such is a unique addition to this collection. Built sometime during the 11th century, and therefore pre-conquest (imagine that!!) it represents a unique survivor of a period before the Normans invaded the British Isles when Saxon rule was dominant over much of the country. The lower two thirds of the tower are of original Saxon construction, whilst the upper third was added around 1588. The Saxon walls are around a meter and a half thick with small round headed windows well above ground level, in each wall. Above. Looking at the West wall of the tower. Note the lack of a door in this wall. The tower is thought to have been a free standing structure originally, and must have held some local importance as it was incorporated into the early Norman church that was built here. Michael Shapland (St Mary’s, Broughton, Lincolnshire: A Thegnly Tower–Nave in the Late Anglo-Saxon Landscape, 2009) sees the Church of St Lawrence at Morland as a surviving example of a Saxon tower nave....a high status structure that served both as a personal chapel and as the residence of a Saxon lord. As such, it's both possible and likely that these types of building would have contained elements of defence and security, being built of stone, with thick walls and small windows, representing a high status residence for someone of local importance. Above. The tall narrow door into the tower, which characterises Saxon and early Norman church towers. Although not seen when I visited the church, the doorway from the Nave into the Tower contains a good set of draw bar slots within the jambs. These features, if contemporaneous with the tower, could further suggest that the tower was built with elements of security (or defence) in mind. I have to be careful here as Philip Davis of the Gatehouse will no doubt question my reasoning...with good intentions of course!!! Above. 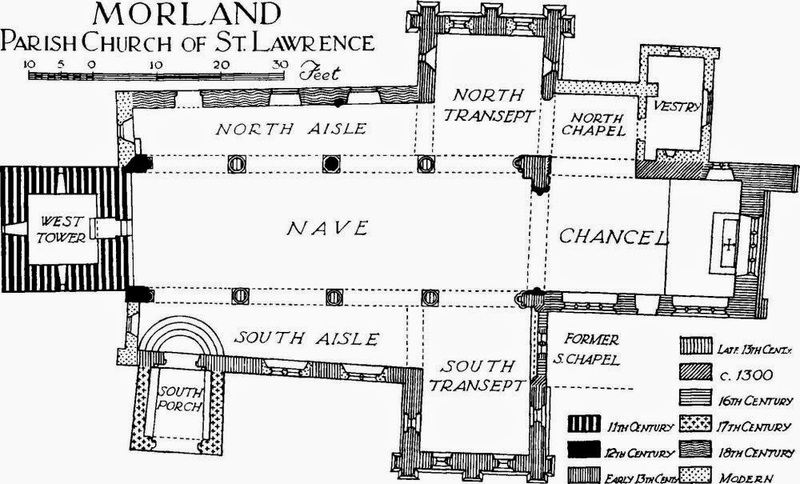 Ground plan of the church, showing the many periods of building that have taken place. Upon the Norman invasion, the lands and parish were ceded to Ivo de Tailbois, who in turn granted the church to St Mary in York. Michael Shapland quite rightly states that the tower\church is not prominent in the landscape....it stands neither on raised ground or amongst earthworks, but would have been visible from any approaches from North, South, East or West.